As they say at Lakeside Amusement Park, “Life is a Roller Coaster, Enjoy the Ride”. And indeed you and the whole family will enjoy everything in the Park it has to offer. Located in Denver, Colorado, Lakeside Amusement Park is a large facility with excitement, history and charm. Complete with trains, a merry-go-round, a drop tower, bumper cars, and many spinning rides, Lakeside is the perfect site for family fun and large events. 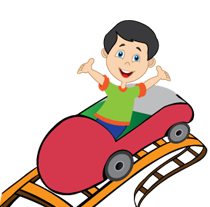 Kiddies' Playland is filled with rides specifically for young children. It has about 40 rides, including a Cyclone roller coaster, a midway with carnival and arcade games, and a rare steam-powered miniature train from the early 20th century that circles the lake. Click here for the complete rates/pricing.